A couple acquaintances introduced me to Doug Hiner and he immediately got on my radar as someone I’d like to profile when I learned he regularly sailed down to Cuba on missions that were partly about delivering medical supplies and partly about secreting back contraband, as in cigars. Hiner is a wheeler-dealer type who denied the illegal trafficking at the time I interviewed him, then expressing upset at my story’s suggestion that he engaged in anything like that, but subsequent events confirmed his smuggling activity because he got caught in the act down in Florida and faced serious federal charges. He pleaded guilty to one count and received 36 months probation. Aside from the intrigue, which occurred after my story appeared, his story is really a classic tale about his taste for adventure and his passion for all things Cuban. A version of the following story appeared in The Reader (www.thereader.com). More than any other country, Cuba both seduces and vexes Americans. This island of paradoxes is at once a natural paradise fulfilled and a socialist promise unrealized. In a place where bare necessities do not go for want, chronic shortages make hustlers out of peasant and professional alike. Within a closed society and controlled economy, anything, for a price, is a black market possibility. Fidel Castro may or may not own Cubans’ hearts and minds, but the land and culture definitely hold residents and exiles transfixed. Social/economic problems don’t change the fact that Cuba, at least geographically, is a tropical island idyll. Sun, ocean, jungle, mountains — much of it pristine. Politicians/bureaucrats aside, the people embrace life with a live-and-let-live Latino insouciance. Music, dance, food, art, love, sun, surf. Fun prevails, if not for all, for tourists. Omahan Doug Hiner sees the schizoid nature of Cuba every time he sails there on his 53-foot cutter, the Vitamin Sea. He captains the Tampa-docked boat on voyages that transport medical equipment to hospitals and clinics on the island. He’s been making runs like this to Cuba for seven years, a period when official American policy toward that intransigent Caribbean nation has gone from rigid to ultra hard-line. Embargoes of one kind or another have limited trade with Cuba and, in some cases, denied aid. With Fidel’s recent stomach surgery making his mortality and his grip on power a renewed subject of world interest, Hiner prepared for a late December sail to bring in another boatload of supplies. But the gringo’s boat blew an engine, pushing the trip back until this month. He arrived February 10 in Havana, where the gear still sits, waiting for the red tape to be cut so he can move stuff inland. His artist wife, Christina Narwicz, usually joins him on these maritime adventures but she wasn’t feeling up to it when he shoved off this time around. Hiner, 67, is a former hair dresser and a retired real estate developer and landlord. He made and lost a fortune. He’s not oblivious to the political realities that hold Cuba hostage in a state of suspended animation. Far from it. He has strong views on what Cuba and its paternalistic neighbor to the north should do to ease restrictions and tensions. His awareness of Cuban medical needs drives his missionary trips there, even as he brings in and takes back his share of contraband. His journeys go well beyond idol curiosity. Hiner and his wife feel they have a fair handle on Cuba by virtue of not only having traveled there several times — it’s 15 trips and counting for him and about the same for her — but their stays usually last weeks or months at a time. They get around to different parts of the island and really immerse themselves in the place. Whatever motivates him, he ultimately makes these journeys because they put him in touch with three of his favorite things — sailing, the sea and people. Though he grew up in landlocked South Dakota and Nebraska, Hiner long ago felt the call of the open sea. Besides, it’s the carefree, unrestricted, port-of-call lifestyle he enjoys, more than the challenge of seeing how far Hiner can push his sailing skills. Still, the allure of cruising wave and wind is like the call of the sirens — hard to resist. Half the challenge is dealing with weather and the other half comes with the inevitable mishaps. “Weather on the high seas — that’s your biggest danger,” Hiner said. “We’ve gone through some pretty turbulent stuff, some accidentally, some on purpose because we had to. But it’s never been a safety issue. You’re never really out of ear shot of weather” reports via radio/radar. Nature-related or not, things do go wrong. Take the couple’s 1999 trip to Cuba for instance. “Going down on the second trip we blew out the sail. We ran into some bad weather. We had to have it repaired. It’s usually mechanical problems. It’s like, not if it’s going to break, but when it’s going to break. The last time we left Cuba the autopilot failed and we had to hand steer for 40 hours. Oh, and coming back from Cuba once we lost our fresh water pump, so we had no engine. There was no wind and we drifted for a day-and-a-half or two days before we finally got close enough to Key West to get a boat to tow us in. Sea-faring is an apt avocation for an inveterate beach bum who, whether inland or coastal, enjoys kicking it with friends over drinks in the Old Market, where he developed some of the first condos, or partying on his boat. He enjoys the simple, well-done pleasures of good food, good drink and good company. His wife’s the same. The residence they fashioned from an old brick-faced bar and parking lot on South 13th Street reflect their shared interests. The grounds’ richly decorated Great Wall that fronts 13th Street has a gated entry whose mammoth door opens onto a large courtyard filled with her plantings. Hiner’s no stranger to graceful living, as he once owned a Fairacres mansion “back,” as he likes to say, “when I was rich and famous.” He made big bucks and moved in tony circles in the ’70s and ’80s. Then it all crashed. He alludes to a business partner running his development company into the ground. The house, featured in the Spring 2000 edition of Renovation Style magazine, is designed with walkouts along the length of the courtyard that connect to a wood deck, creating a veranda. The interior opens up to a loft master bedroom and guest quarters, revealing a 32-foot-high ceiling and a bank of large windows that stream light in. At one end of the property is a screened-in porch. At the back of the lot is Christina’s well-lit studio. It all works toward a cozy hacienda feel. His passion for this getaway within the city dovetails neatly with his ardor for Cuba. It always comes back to communing with people. Years living under the thumb of a dictatorship has its palliative effects. While Cuba prides itself on a system that accounts for citizens’ basic needs, rampant poverty compels most everyone to be on the make. Amid all this naked human need, Cuba takes great pains to put on a good face. “They sweep each block of Havana every day. If you don’t have anything to do, they’ll put a broom in your hands,” he said. By Western standards, he said, Cubans lack everything we take for granted. He tries to give friends there some creature comforts otherwise unavailable to them. He’s also brought back, on consignment, works by Cuban artists he and Christina sold in Old Market art shows, the proceeds going toward supplies for the artists. He’s sympathetic to the plight of the Cuban people, whose deprivation goes deeper than a lack of material things, to essential services. Sure, Cuba provides free health care, but many clinics and hospitals lack equipment and technology that can not only improve care but save lives. And while average Cubans and natives of nearby Latin American countries have access to free care, some medical centers are reserved for the elite. It’s why he got involved as a medical supplier in the first place. His awareness began on his inaugural visit to Cuba in 1998. The marina in Havana introduced him to fellow travelers, including many Americans, some of whom became a model. Over the next year Hiner beat the bushes and made contact with “various organizations” that run aid into Cuba.” He cultivated the names of key suppliers, like Jack Oswald in Chicago, and key recipients, like surgeon Gilberto Fleites in Havana. When Oswald, who works with a group called Caribbean Medical Transport, ran a check on Hiner’s then-fledgling medical mission activities he was duly impressed. “The medical equipment he gets is a cut above most of the stuff humanitarian aid groups get and I’ve been doing this a long time. His stuff is absolutely flawless,” Oswald said. “I went with him on his last trip because he was packing some really heavy equipment…I came from Chicago to help him figure out a way to put some of this stuff on the boat without it sinking. We put thousands of pounds on the bow…and you no longer could see to navigate…so we had to have somebody at the front of the boat calling instructions out to the captain just to avoid the reefs and boats and weather we came across on our way to Cuba. It got a little adventurous here and there. On Hiner’s first supply run in 2000 he was introduced to Dr. Fleites. “I met Gilberto and his wife Teresa and they were really neat people and we became really close friends and we had a really wonderful time there,” Hiner said. What began as annual trips became twice-a-year voyages. Their last trip, in 2005, they were in Cuba four months. He’s transported medical gear worth hundreds of thousands of dollars, including mechanical operating tables and surgical instruments ranging from forceps to retractors to endoscopic devices. The goods ship to a central location and, when there’s enough for a full haul, he loads a truck and drives it to his boat in Tampa. 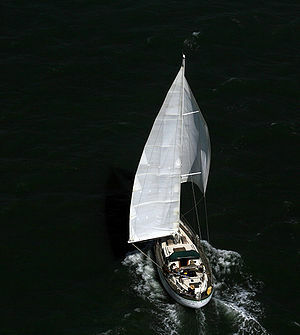 After everything is securely stored and lashed aboard, he rigs his boat and sails for Cuba. Once there everything must be checked and approved by customs officials, a process that can take weeks. Various government stamps and seals are needed. From start to end, a single supply mission can take months. He cuts what red tape he can with “gifts” to marina workers and ministry officials. For the current trip, he amassed a large inventory that includes an entire delivery room donated by a hospital, complete with delivery table, incubators and monitors. So large is the haul he left half the load in Florida for a return trip next month. Donations have never been better, but he said navigating the bureaucratic waters to get them to Cuba has become more problematic. He blames the Bush administration for “tightening travel restrictions,” especially since 9/11. He said the feds have made it harder for the nonprofits he works with to obtain or renew licenses. The main clearance he needs is from the U.S. Coast Guard that grants free passage through “an imaginary security zone between Key West and Havana that no one can define.” Without the permit, he said, “they can seize your boat, fine you $250,000 and put you in jail for 10 years.” When things were more “more relaxed,” he could slide by. Not now. There are also new Commerce Department and Council of Foreign Currency Control approvals needed. Ironically, Hiner’s romance with Cuba may never have happened if not for an accident. It was late 1998. Doug and Christina were on one of their Caribbean sailing jags and had put into port in Jamaica. There, Christina took a fall and broke her ankle, putting her in a cast. He hired a young Jamaican boy to help him crew. The trio sailed to the Camyan islands, where Christina’s pain worsened. Doug sent her home by plane. That left Doug and the boy. The idea was to make for Florida, but Doug knew the boy would be denied entry without papers. Next, Hiner set his sights on Key West, but learned that, too, was off-limits. Desperate, he asked officials, “Where can we go?’ ‘Cuba,’ they told him. “So, the next morning off we went to Cuba. That was my first time. We were there almost 10 days before I was able to get a plane to fly him out to Montego Bay. And while in Cuba I just loved the country. When I got back home I told Christina, ‘I loved it so much we need to go back there.’” Go back they did.